Enjoyment and fun for both old and young, this time with historical themes. 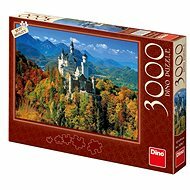 The puzzle contains 2000 pieces that will delight all puzzle enthusiasts, beginners and advanced builders. Each piece is unique and fits perfectly into the other parts. 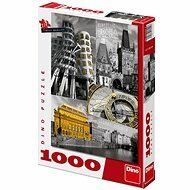 Puzzles are an excellent means of relaxing after a busy day or as family fun in bad weather. At the same time it develops fine motor skills, imagination and memory. The image can be glued after folding, so it can be then used as an original decoration in your apartment. For shipping to other EU countries visit this page Dino Historical World Map. Für Versand nach Deutschland, besuchen Sie bitte Dino Historische Weltkarte. Chcete doručit zboží do Česka? Prohlédněte si Dino Historická mapa světa. Chcete doručiť tovar na Slovensko? Prezrite si Historická mapa sveta. Für Versand nach Österreich, besuchen Sie bitte Dino Historische Weltkarte. Magyarországra történő kiszállításért tekintse meg ezt a termékoldalt: Dino Antik Történelmi világtérkép.